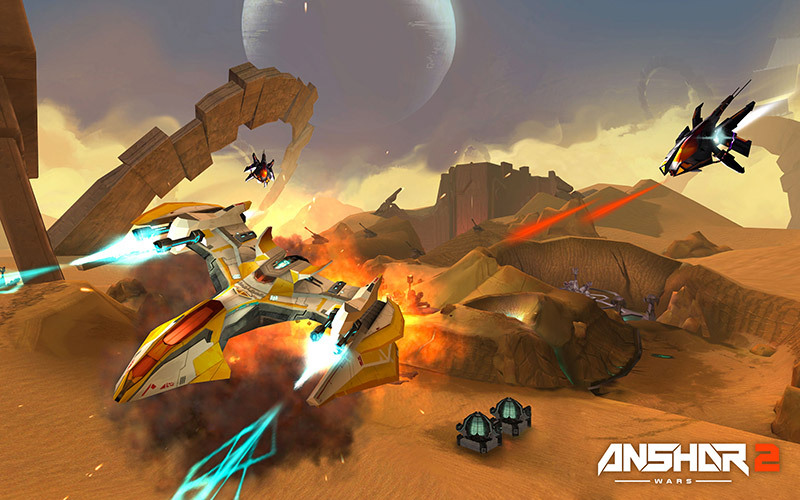 Anshar Wars 2 is an exceptional arcade-style, space dogfighting game for Samung Gear VR. The successor for the popular Anshar Wars that tells the story of an eternal conflict between Anshar and Nergal forces. This VR game was designed to be played only with your head. Features space combats in three beautifully rendered scenes, packed with intense missions and purchasable ship upgrades. A highly praised VR space shooter. 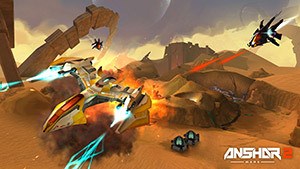 Anshar Wars 2 is the sequel to the first Anshar Wars game, which was released as a launch title for Samsung Gear VR. The game demonstrated how refreshing and enjoyable a simple space shooter can be when played with a virtual reality headset. The original Anshar Wars was designed to be played with using Gear VR and a gamepad, but could be played entirely using the headset. This little ambitious interstellar shooter had received many positive reviews and was praised by many players who played it on their Android smartphone and Gear VR HMD. The graphics are pretty impressive, I mean, for a mobile game. The space combat mechanics are simplistic, but the combat fights are very satisfying. The goal of the game is simple, destroy all the enemy ships and try to avoid asteroids and getting hit be the enemy or crashing into another vessel. Ammo and health are limited. You can refill your health and ammo supplies by collecting ammo and health packs, which you pick up in the battlefield. You have two primary weapons at your disposal, a turret that shoot rapid-fire lasers and lock-on missiles. You earn points by defeating enemies, and there is a global leaderboard where you can see how you rank against others based on the number of enemy ships you destroyed. Anshar Wars 2 is based on the same winning formula that worked so well on in the original game. The game features three type of spacecraft and various environments inside which you'll be given many missions to accomplish. Experience and credits are the in-game currency that you collect based on your performance in those intense missions. You can use your experience and credits to purchase further updated for your ships. The combination of an already beloved gameplay mechanics, beautiful vivid, high-resolution graphics with a vastly improved gameplay experience - all should make Anshar Wars 2 one of the must have games for Samsung Gear VR owners. Anshar Wars 2 will be compatible with Gear VR Note 4 and S6 versions at launch, but it will support future versions of the Samsung Gear VR as well. Game is planned to be released this fall 2015.